I like pastors. I like pastors a lot. I think pastors have an incredible role to play in the Kingdom of God and it is a hard role/calling to fulfill. In the spirit of full disclosure, I am a pastor’s kid. I have a little understanding of what goes on “behind the curtain” in a pastor’s life and because of that, I have a tendency to default to giving pastors the benefit of the doubt. Pastors are not perfect (and neither are you). Pastors have been given the authority to serve and shepherd the congregation. PRAY FOR YOUR PASTOR. I know it sounds cliché, but it is not intended that way. I have discovered that it is very difficult to be critical of those I pray for. COMMUNICATE IN YOUR PASTOR’S LANGUAGE. Sometimes you may not have the opportunity to speak directly to your pastor. It seems the larger the church, the less face time some youth pastors have with their pastor. Not to worry. Ask your pastor how prefer to be informed or kept in the loop of what is going on in student ministry. If your pastor likes to use email and you prefer texting, communicate via email. If your pastor prefers a phone call, then pick up the phone and call. It is one way you honor your pastor. ALWAYS KEEP YOUR PASTOR INFORMED. Even if you feel like they don’t care to know everything. Especially if something has gone wrong! Let them hear it from you first. We all make mistakes. If it is yours, own it and inform your pastor immediately. Do not ever let someone else disclose what you know to be an error on your part. NEVER SAY NEGATIVE THINGS ABOUT YOUR PASTOR OUTSIDE THE EARSHOT OF YOUR PASTOR. If you have an issue with your pastor, talk with your pastor about that issue. If you need to take someone else with you to speak to your pastor, then make sure you have not prepped that person to be “on your side”. You are going to find resolution, not sabotage or mutiny. NEVER ASSUME YOU HAVE ALL THE INFORMATION. 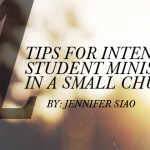 I speak with many student ministers who get incredibly frustrated with the decisions that their pastor makes. Always remember, not matter how much you know about a situation, you may not know all the information that figures into the decision that was made. IF YOU REACH AN IMPASSE, IT VERY WELL MAY BE TIME FOR YOU TO LEAVE. This is a tough one. Leadership styles may be the core issue, or arrogance on your part or the part of your pastor may be the issue. Sometimes roles change on staff and you may be asked to lead in a way that differs from your “calling”. HONOR THE POSITION EVEN WHEN YOU STRUGGLE WITH THE PERSON. God has placed your pastor in that role in your church. Pray for your attitude to change toward your pastor, and even when you do not like something your pastor does, honor the position that God has placed them in. Never assume you are always right and everyone else is wrong. Unless you are Jesus of course. *If your pastor is involved in something illegal or immoral, work through the proper channels established by your church’s policies and procedures. Always default to reconciliation and restoration through Biblical standards.